Two historical posts in one week!? I know! And I’m in the middle of moving so things are hectic. But coincidentally, August 6th holds another historical meaning for me in terms of what I write about. 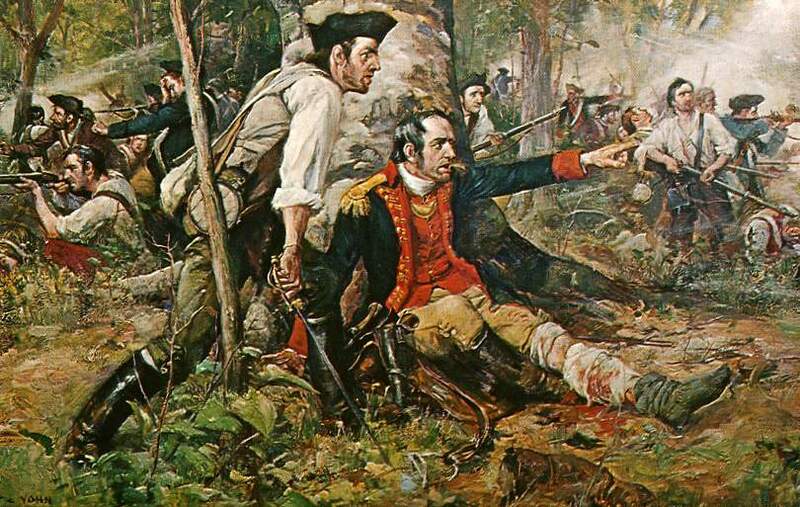 This year marks the 238th Anniversary of the Battle of Oriskany. I have mentioned here before that in school I never learned about the Oneida Tribe’s contribution to the American Revolution. Subsequently, I also never knew about the Battle of Oriskany. Upon research, I found that this battle was quite significant in that, in a way, it marked the official entrance of the Oneida Tribe into the war as combatants. The battle came to fruition due to the siege on Fort Stanwix courtesy of Lieutenant Colonel Barry St. Ledger (prompted by Burgoyne’s effort to cut New England off from the rest of the colonies.) General Herkimer of the Tyron County Committee of Safety aimed to relieve Fort Stanwix not only for obvious strategic reasons, but also because the fort served as a hub of commerce and trade for the Continentals, local Palatines, and the Oneidas in nearby Oriska village. The siege of Fort Stanwix caused a rippled effect in the well-being of the local community. Meanwhile, Joseph Brant’s formidable sister Molly Brant (former “wife” of Sir William Johnson) caught wind of Herkimer’s plan to relieve Fort Stanwix. Molly quickly sent word to her brother, who then conferred with Johnson and Butler about the advantages that should be taken. On the hot morning of August 6, 1777, Herkimer’s militia and a group of Oneida warriors from Oriska set out on the road toward Stanwix. The column was made to wait on this narrow road for several hours until Herkimer received the signal to advance. But during this time, the militiamen grew annoyed and restless. They began to heckle and prod Herkimer to find out why they were waiting so long. Frustrated and fed up, Herkimer shouted “We March” – without the proper signal from ahead. 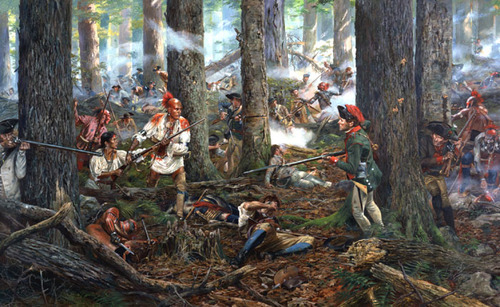 Little did the Tryon County Militia and the Oneida warriors know, Joseph Brant and his Iroquois warriors – along with Butler’s green-coated Rangers – were lying in wait just up the way. Crown-allied forces ambushed at a bottleneck of the road, near the crossing of a stream/marshy ravine. It is no surprise that the ill-trained militia quickly frayed. The battle ensued, with Herkimer’s militia and the Oneida warriors regrouping in a copse of trees further east. Unlike the “civilized” battles we think of in 18th century, orderly warfare – Oriskany was marked by brutal hand to hand combat. Militiamen and rangers were no match for experienced warriors of the Iroquois – on both sides. It is during this time we get the famous story of the Oneida woman Two Kettles Together fighting alongside her wounded husband (Hon Yerry), wielding two pistols. We also get the story of Herkimer, wounded in the leg, propped against a tree and still shouting orders. Soon after, the Iroquois encamped with the Rangers and British Regulars around Stanwix grew restless. In time, the entire Crown-allied force abandoned the siege. Contrary to some sources, Herkimer did not die on the battlefield, but rather a few days later at home. Although Stanwix may have been relieved, the Oneida tribe paid dearly for their alliance with the Continentals. Many warriors returned to nearby Oriska to find their village completely destroyed by Joseph Brant and his men. While some were able to escape, many Oneidas in the village were killed or taken prisoner. Homes were burned, livestock stolen or slaughtered. Oriska was decimated. The rest of the Crown-allied Six Nations viewed the Oneidas’ alliance with the Continentals as a familial betrayal, and in turn, they exacted revenge. As a chilling aside: Many years later, bones still lay in and around the vicinity of the road from Oriska to Fort Stanwix; a ghostly reminder of Joseph Brant’s ambush. And if Light & Stone ever leaves my hard drive, you’ll get to read about the Battle of Oriskany from the perspective of an Oneida warrior!